The Aluminium Chairs EA 105-108 are the quintessential solution for meeting venues. They are found in countless finely furnished offices, conference spaces and meeting rooms around the globe. 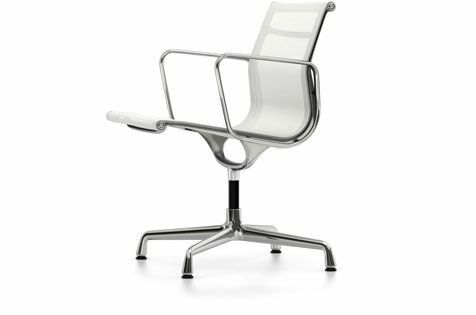 Thanks to their generous proportions and resilient sling seat - a panel of leather, fabric or mesh stretched between two aluminium ribs - the chairs are exceedingly comfortable. And with such a wide selection of upholstery colours, it is easy to find the perfect chair for every interior. Die-cast aluminium, polished or chrome-plated finish.